This is a native crested iris and a star of the spring season with delightful lilac-blue blooms. It is excellent for small gardens and naturalizes quickly and extensively. This may cause large masses of the plant to grow over time and you will need to control it to suit your garden. 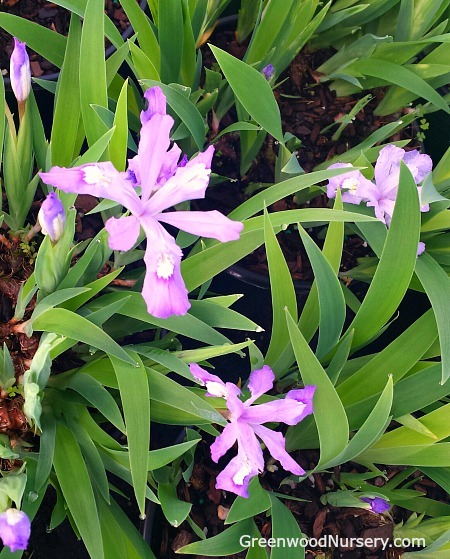 This herbaceous Iris cristata, low-growing plant typically only grows to 3-6” tall. When in bloom it produces an eye catching blue floral array. Named after the Greek goddess of the rainbow this iris has a variety of colors from the yellow tinged falls on its flowers to the green foliage. It typically grows in rocky, woody slopes, along streams and on bluffs. You can propagate them by dividing and replanting the rhizomes every two to five years. Plant it with part of the rhizome above the soil in an area with good drainage. They are shallow rooted which enables quick spreading. Provide enough water at this initial stage to ensure they take root. Its dagger-shaped leaves grow 5-6 inches tall and form a significant crested iris ground cover. This iris is related to most garden irises and enjoys moist, acidic soils but it is versatile enough to adapt to dry shades. It has medium water requirements. The showy flowers attract butterflies, hummingbirds and bees and are deer and drought resistant. They are excellent for native ground cover in a woodland garden and provide height variation to other taller plants. You can plant them alongside their White Tennissee Creste Iris cousins for a sharp contrast of color. This iris poses few problems and is a low maintenance plant. It makes an excellent border plant. You may also use this plant as an alternating seasonal native ground cover plant for a woodland garden. Dwarf Blue Crested Iris is grown in one gallon containers. Orders shipping to CA or AZ may be bare rooted before being prepped for shipping.